On Saturday 11th January the Friends together with the Rangers and other willing volunteers convened in the spruce wood for a spot of rhoddie bashing. This event replaced the pre-Christmas event which was cancelled because of bad weather. Luckily the weather was good, the rain stayed off and as a result a considerable area of invasive rhododrons was cleared from under the standing trees. The cut material was destroyed by burning, and the resultant bonfire came in very useful for heating the post Christmas mince pies at lunchtime. These were in addition to the very welcome homemade soup and hot rolls kindly funded by CSV. The picture on the left shows the results of our labours. 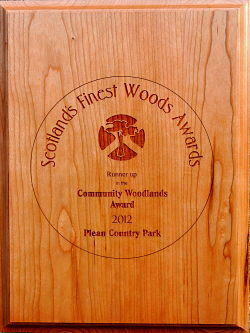 The wood is now opened up and light can now reach the forest floor encouraging native regeneration.